Social Sara: Fashion Friday + A Nautical Surprise! Fashion Friday + A Nautical Surprise! Happy Friday! The weekend is finally here and that's the best news I've heard all week! I'm so ready to take a load off and just relax for the next several days. Today's Fashion Friday is all about the beach. Here's a look I put together to be Beach Ready! Oh and I should warn you...this post is a little long but bare with me because there's a treat for you at the end. Personally, I do not enjoy shopping for swimsuits but this one definitely caught my eye. I love the colors...pink and navy are one of my favorite combos. I paired this suit with my fave pair of sunnies, understated earrings and a cool, reversible beach bag from Jack Spade. And with that, I think I'm ready to hit the beach! What about you? Oh Buoy Boston for a sweet little nautical giveaway. Amanda and Lindsey, the creative beauties behind Oh Buoy Boston blog and shop, hand craft the most adorable nautical inspired accessories you've ever seen! Their darling bracelets add just the right touch of nautical flare to any outfit. I have really enjoyed mine and will be wearing it all around Bar Harbor this weekend. It's the perfect accessory for summer, don't you think? 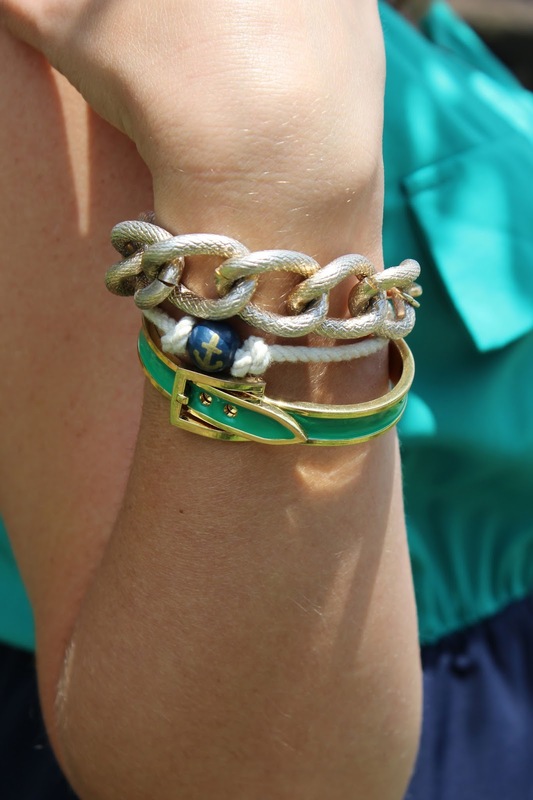 When I saw this anchor rope bracelet, I instantly knew I needed it! Y'all know I love anything nautical and it was the missing piece to my summer stack. It fits nicely in the middle of any stack or on it's own for that unexpected touch of maritime style. Oh Buoy Boston has many accessories to choose from. I'm also crushing on this bracelet and these hair ties. And, I may just order this bracelet when I get back from vacation! Each bracelet is hand crafted and painted free hand so no two are alike! 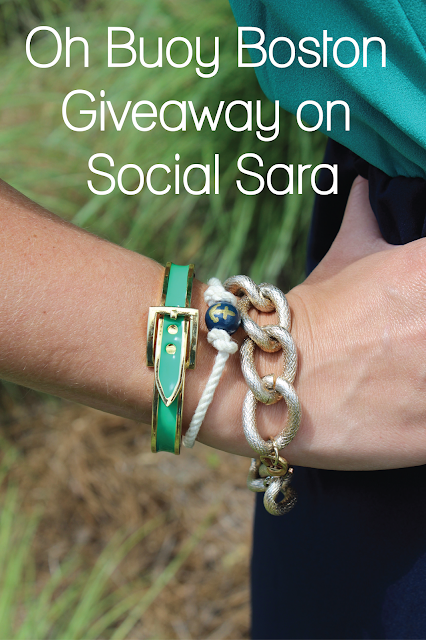 Enter to win this aqua and red anchor bracelet using the Rafflecopter below. A winner will be chosen the week of July 8th! As always, thanks for stopping by. Have a great weekend, my friends. I'll see you on instagram @social_sara this weekend and back here next week. I'm really loving the Buoy Bangle in mint and white. The contrast on the inner side of the bracelet is my favorite part! Thanks for letting us know about a new Etsy shop! You are the perfect model. Thanks for featuring us, and good luck to everyone that enters the contest!! I just love the knot bracelet!! Such fun and cute accessories! Thank you for the giveaway Sara, Lindsey & Amanda! 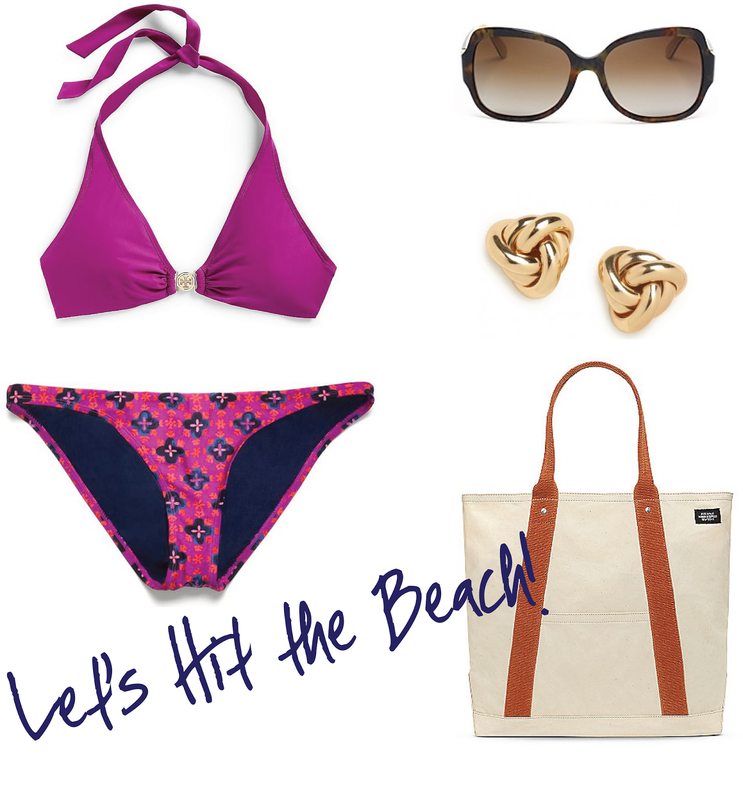 I love the color of the swimsuit (plus I love Tory Burch)! Great color combination. Have a great weekend! So fun!! And since I'm a Boston girl myself, I'm even more excited for this giveaway! My favorite item is the Custom Hand Cut Map with the great big heart in Boston!